Karate is a martial art which originated in Asia but has become hugely popular the world over including New Zealand. With its emphasis on self improvement and non aggression, it is a great activity for kids and adults alike! Martial Arts Principles. Find out why everyone is so fond of karate! This video shows some Assertive Communication Skills. 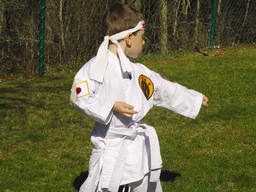 Martial Arts Classes can be taken by kids from 3 years old! Will your kids enjoy Karate? Could your kids benefit from some additional discipline and focus? Karate can improve kids’ confidence and self esteem as well as teaching valuable self defence techniques. Karate provides an opportunity for kids to practice their technical skills in a safe environment while being supervised by qualified instructors. Lessons can start from age 5. Karate also promotes fitness and can help kids develop co-ordination. One of the first things kids learn is how to fall and roll safely on karate mats, and these early lessons can be very helpful and confidence building for children who tend to be a little fearful. It’s also a sport that recognises progression and learning by way of awarding various coloured belts. This allows kids to strive towards a sense of achievement. How can you organise Karate lessons and matches for your kids? Are you confused by the array of karate schools in your area? There are many different Karate styles although most share similar values. It might be a good idea to take your child along to a few different single classes and see how they get on. Not all kids’ activities are suited to every child, and not all karate schools will work for your child. Karate lessons usually run for term periods and costs are around $70 per student per term. Uniforms cost extra and most other equipment will be provided by the school. If there are no karate schools in your area, there may be other forms of martial arts such as Jiu-jitsu or Aikido which could be suitable for your child. The skills learned during karate may be transferred over to other areas of your child’s life such as academic work and cleanliness, so there could be benefits for everyone! Check the ActiveActivities directory for more information!